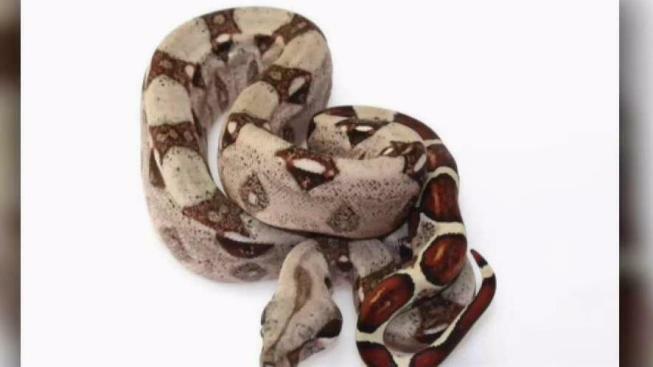 Police say a seven foot Red Tail Boa Constrictor was possibly last seen near Bieler Park in East Greenville Borough, Montgomery County. Police say the Snake owner confirmed the snake is missing and that a window screen appears to have been pushed out. "Vinnie," a 10-year-old boa constrictor missing from his Montgomery County home, has residents on edge in a small Pennsylvania community. The East Greenville Borough made the announcement via its Facebook page on Monday afternoon that the 7-foot red tail boa constrictor was on the loose. A friend of Vinnie's owner tells NBC10 the snake went missing four weeks ago, but owners only recently realized he had escaped the home. That's when they called police. So far there have been no confirmed sightings. News of Vinnie's escape led to a change of plans for some events. According to another Facebook post, a lunch event in nearby Bieler Park was canceled "due to a large animal on the loose near the site." Although it is uncommon, the red tail boa constrictor is known to occasionally attack humans when it perceives a threat. Vinnie, the friend said, is friendly. Anyone who spots the snake is asked to contact the East Greenville Police at 610-635-4300. Note: This story has been updated to reflect a new statement from East Greenville Borough.